Welcome to Grantland’s 2012 MLB Breakout Players of the Year, the first in what will hopefully become an annual tradition of semi-educated guesses on the season’s biggest performance leaps. Before we begin, let’s define what constitutes a breakout. Rookie-eligible players don’t count. Established players who have late-career spikes after a down period (like, say, Alex Rodriguez, who’s a good bet to do just that) don’t count either. We also won’t count players who were called up in-season last year, had big performances, and used up their rookie eligibility. In other words, Brett Lawrie and Desmond Jennings will likely set career highs in many counting stat categories given they’ll be playing every day in 2012; but their rate stats (especially in Lawrie’s case) probably won’t go up much, if at all. We’re looking for players with major league experience who haven’t yet had their best seasons in terms of both rate stats (AVG/OBP/SLG/wOBA for hitters; ERA/FIP/xFIP for pitchers) and counting stats (HR/RBI/R/WAR for hitters; W/K/WAR for pitchers). For instance, last year that list would have included Jacoby Ellsbury (good player makes the leap to MVP candidate), and also Matt Harrison (struggling player has his first above-average major league season). Splits like those can sometimes be due to little more than random chance. But it’s also possible that Morrow’s simply a different pitcher with men on base, that his mechanics aren’t as sound pitching from the stretch or even that his approach changes as the pressure of a situation escalates. Either way, if the rest of the world can see it, surely Morrow and pitching coach Bruce Walton can, too. Pitchers with strikeout rates that huge usually see their bubble-gum stats start to catch up with their peripherals at some point. A few offseason tweaks, a couple more breaks, and a season full of health could yield 200 innings and really big results. David Freese: If the second-half theory is a popular breakout predictor, the notion of betting on a playoff hero has gone from an embraced idea to a rejected one among some analysts. After all, if we have 187 regular-season games’ worth of evidence that Freese is an ordinary player, shouldn’t we avoid getting swayed by 18 playoff games in which he hit like Babe Ruth? Here’s the thing, though: Freese has been considerably better than ordinary over the course of his career. He hit an impressive .307/.384/.531 in 399 minor league games, and sports an above-average .298/.354/.429 line in the majors. Call him a late bloomer, given he turns 29 this year. But the power and playable defense have always been there; health has been the one thing holding Freese back, often with unlucky injuries like last season’s broken hand the culprit. We’ll likely see some regression from his career .365 BABIP, but also a lot more games played than 2011’s career high of 97. Projected to bat fifth behind Carlos Beltran, Matt Holliday, and Lance Berkman, Freese could produce numbers that help the Cardinals win and help win fantasy leagues. Derek Holland: Take it away, Monday’s Rangers preview! The notion that second-half stats can predict a breakout is a controversial (and not necessarily correct) one in baseball circles. But Holland was a command hound throughout his minor league career, putting up terrific strikeout-to-walk ratios — something he finally managed to do in the second half of last year, when he struck out more than three batters for every walk issued. He’s 25 years old, with 63 major league starts under his belt. Call this a hunch pick if you must, but this could be the year he becomes a 5-WAR pitcher (or better). Mat Gamel: Once the no. 34 prospect in the game per Baseball America, Gamel’s career has been … not as hot a party as people anticipated. The lefty slugger hit .325/.392/.531 across Double-A and Triple-A in 2008, earning him that first big prospect ranking and also his first taste of the majors, a two-game cup of coffee in Milwaukee. The Brewers loved his bat, but urged him to work on his defense at third base if he wants a shot at a full-time job. He started back at Triple-A in 2009 and continued to hit for power, though with a rising strikeout rate and the same lousy defense weighing down his value. Still, Milwaukee called him back up in mid-May, whereupon Gamel proceeded to whiff at a rate that even the Adam Dunns of the league couldn’t touch; only a flukish .371 batting average on balls in play saved his 61-game audition. He went back to the minors in 2010 and again hit well, posting a line of .304/.388/.496, hiking his walk rate and trimming his strikeouts a bit. Still couldn’t catch the ball to save his life. Back he went to Triple-A last season, where Gamel hit .310, slammed 28 homers, and struck out less frequently than at any point in his career. By this point it was clear that he couldn’t play major league-quality defense at third and could only manage on a National League team at first — the position occupied by one Prince Fielder. Mike Ilitch threw $214 million at Fielder this offseason, so Gamel finally gets his shot. He turns 27 in July so he’s not what you’d call a prospect anymore. There’s also some concern that his improved offense and overall approach was more a function of repeating Triple-A multiple times rather than actual progress. But there’s a lot to be said for giving a player a clear shot to succeed, while also limiting his defensive responsibilities. The smart money’s on Gamel ringing up plenty of whiffs, and maybe struggling to hit lefties at times too. But in a National League suddenly low on high-level first-base talent after Joey Votto, Gamel could settle in as one of the better power hitters at the position. If the Brewers let him play, 20-plus homers are a reachable goal. 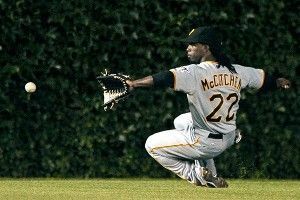 Andrew McCutchen: We need one Ellsbury-style breakout to round out the list, and McCutchen’s it. In his third big league season, Cutch set career highs in a few categories, including homers (23), walks (89), and Wins Above Replacement (5.7). But he’s fared better in other areas in previous years: a solid 84.6 percent contact rate and 33 steals in 2010, a career-best .327 BABIP in 2009. He’s got subtler skills, too: improving defense in center field, above-average base running, and an extreme aversion to double plays (just 16 GIDPs in 1,824 career plate appearances). The Pirates knew what they had, which is why they threw $51.5 million at him to lock up McCutchen for the next six years (seven if the Bucs exercise their club option). Entering his age-25 season, you get the sense he’s going to consolidate all of his skills soon and become an MVP-caliber player … even if the rest of his team still lags behind.